We selected AWS because many customers are already using AWS, which not only has various technology partners with expertise but also provides fast customer support. Established in 1980 and based in South Korea, Woongin Thinkbig is an educational service company that provides study rooms, learning centers, online and offline book publishing, and more for infants and adults, as well as learning workbooks and a complete collection of books targeted toward children. The organization built an integrated data-analytics platform that provides customized services to customers and launched an artificial-intelligence learning-coaching service using customized recommendation engines. Woongjin Thinkbig’s core business consists of “Book Club Study” that provides learning content and “Book Club Together” based on remote video learning. Woongjin Thinkbig has more than 440,000 members and provides mobile learning services covering more than 740,000 subjects. The organization planned to analyze members’ learning types and design customized learning solutions based on large amounts of data accumulated over many years. However, the organization's existing on-premises environment failed to support big-data analytics. Woongjin Thinkbig looked to the cloud to help it support this project with reasonable costs. “We decided to move from on-premises to the cloud because we wanted to test big-data analytics as a small unit that can be run promptly, and it was the time for physical-resource expansion,” said Yoo Ji-hyoung, general manager of Woongjin Thinkbig’s Book Club Service Development. Woongjin Thinkbig compared global cloud providers from in terms of costs, technology, infrastructure, customer support, and market share. “We selected AWS because it received the best evaluation and since many customers are already using AWS, which not only has various technology partners with expertise but also provides fast customer support,” Yoo explains. He adds that AWS was selected because it can support the various functions needed for Woongjin Thinkbig and will provide infrastructure flexibility and stability for future data platforms. 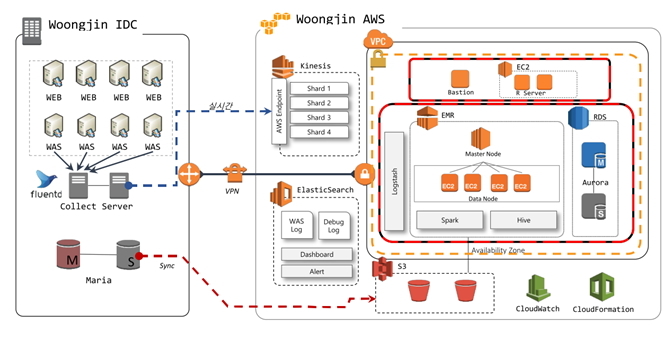 Woongjin Thinkbig uses Amazon Kinesis for real-time data processing with the support of Megazone, an AWS Partner Network (APN) consulting partner, and configured Amazon EMR for placement analysis. It configured a real-time data-analysis system through Amazon Elasticsearch Service and added the Amazon Aurora database for structured data storage and analysis. It uses Amazon Simple Storage Service (Amazon S3) as cloud-based storage. Below is the architectural diagram of Woongjin Thinkbig. In selecting AWS, Woongjin Thinkbig’s goal is to analyze large data sets and provide customers with the results promptly. According to Woongjin Thinkbig, providing customized services while directly showing big-data analysis results has improved members’ learning habits as well as grades. “It was impressive that the big-data analytics project continued for about three months, and that the company’s move to the cloud has been built faster than I thought. The Amazon S3-based data platform enabled us to reduce operating costs, and the stability and performance of the analytics system were more satisfactory than I expected,” Yoo says. He added that having easy connectivity with other services was the main motive behind Woongjin Thinkbig’s entire infrastructure transition to the AWS Cloud. Yoo also noted that analyzing big data in the on-premises environment would require enormous expense and manpower. Using AWS, Woongjin Thinkbig could obtain its desired results with a few clicks within a short period thanks to active support from AWS and Megazone. • AWS Partner Network Premier Consulting Partner. Megazone provides IT infrastructure design, construction, and management services for enterprise customers. Megazone has teams dedicated to big data as well as enterprise consultation and migration. • For more information on how Megazone can help construct and manage your AWS environment, see Megazone's listing in the AWS partner directory. For further information, visit https://aws.amazon.com/ko/big-data/getting-started/.